"From Cold War to Hot Peace: An American Ambassador in Putin's Russia"
"U.S. Foreign Policy in the Trump Era"
Michael McFaul served as U.S. Ambassador to the Russian Federation (2012-2014), and is currently a Professor at Stanford University, an analyst for NBC News, a contributing columnist to the Washington Post, and a New York Times bestselling author. 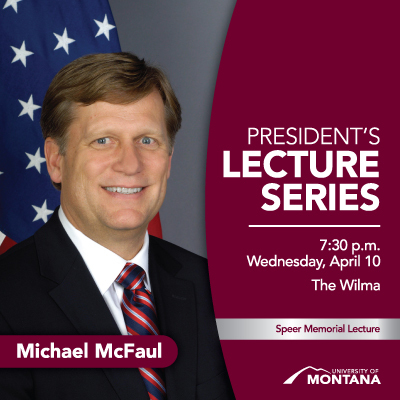 Professor McFaul was born and raised in Montana. Michael McFaul is the Ken Olivier and Angela Nomellini Professor of International Studies in Political Science, Director and Senior Fellow at the Freeman Spogli Institute for International Studies, and the Peter and Helen Bing Senior Fellow at the Hoover Institution, all at Stanford University. He was also the Distinguished Mingde Faculty Fellow at the Stanford Center at Peking University from June to August of 2015. He joined the Stanford faculty in 1995. He is also an analyst for NBC News and a contributing columnist to The Washington Post. McFaul served for five years in the Obama administration, first as Special Assistant to the President and Senior Director for Russian and Eurasian Affairs at the National Security Council at the White House (2009-2012), and then as U.S. Ambassador to the Russian Federation (2012-2014). He has authored several books, most recently the New York Times bestseller, “From Cold War to Hot Peace: An American Ambassador in Putin’s Russia.” Earlier books include Advancing Democracy Abroad: Why We Should, How We Can; Transitions To Democracy: A Comparative Perspective (eds. with Kathryn Stoner); Power and Purpose: American Policy toward Russia after the Cold War (with James Goldgeier); and Russia’s Unfinished Revolution: Political Change from Gorbachev to Putin. His current research interests include American foreign policy, great power relations between China, Russia, and the United States, and the relationship between democracy and development. The program will also be available for viewing at MCAT Video On Demand after the original air date. Additional lectures can be found by entering "President's Lecture Series" in the search bar to choose your preferred video.